One of the many difficulties in trying to get a 5.5m long double Banana across Europe is communication. The large file size of photos (and impossible video file sizes) means I need good internet connections. Here in Germany there are few places with internet available, and those that do have it put restrictions on time or limit the connection; surprisingly the MacDonald’s here also do the same. I sent photos to my Facebook page one at a time, reconnecting each time the four minutes ran out, and sent all I had written to that point to this website, including the unfinished blog on the 3rd of May; eventually giving up when the connection completely failed. In this last week the Banana and I have travelled all along the Rhine, past the River Mosel at Koblenz and left it, turning up the River Main at Mainz. 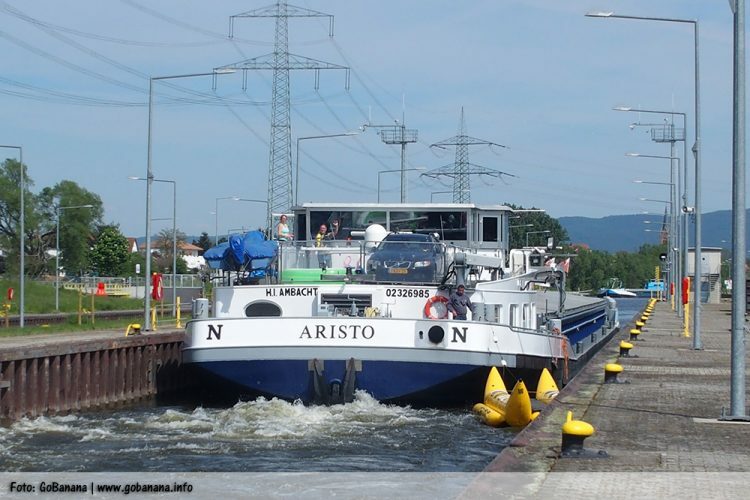 At this moment I am in the motorhome on the wharf of a lock in a small town called Aschafenburg; if you want to find it with a GPS it is N 49° 56’ 10” (then) E 09° 07’ 58”. I know this because the motorhome has got lost a few times, because of me not being able to give correct addresses to where I am. The Locks and small marinas often are down a dirt track with no street name. Getting from a lock (often having to climb over security fences) to find the name of the nearest road is not easy with all the equipment. In Frankfurt, going back and forth from the motorhome to where I left the Banana, meant I had to leave some things on the bank. Someone thought it was funny to either steal or throw the flag base into the river. In either case it was not with the flag three minutes after I left it. This, in a very well ordered part of the city was a great surprise. I have travelled on everything from four berth pleasure craft to the largest single ships that can possibly navigate the route, in the last six days ‘excluding the luxury cruise ships). I have communicated using what is left of the German, which I spoke very badly forty years ago, and used English with people who only know it as much as I know German. Trying to explain what I am doing dragging a Banana across Europe is bad enough when people speak the language, but when they don’t know the language very well, they are completely puzzled about what I am going on about. It is not easy to get a lift in such circumstances. Once on board a ship, the conversations begin and there is often no time to write up the events of the day, or previous day. Now is a good example of the difficulty of having time to write. I am at the lock side, bag packed and Banana positioned ready to go. The Lock gates have just shut on the upstream side, meaning that there is a ship or boat coming towards the lock from downstream; going my way. I will have only a few moment s to get to the lock side (climbing around the security fence) to go and ask for a lift. The biggest ships only have 12.5cm clearance at each side and the captains are fully occupied until they bring the ship to a halt and tie it up. That leaves just a few minutes to convince them to tie a Banana onto their multimillion euro ship and set off looking like someone wearing a party hat at a funeral. Getting the Banana into the right position for a lift isn’t easy either. If you go hitch hiking for a lift from a car, you don’t try to get someone to stop on a motorway; you go to a traffic light or an island etc. If I wait at the bottom of the locks the ships go straight past into the lock and the doors close behind so no chance to get the Banana in as the captain may well not want the Banana. Below a busy lock is good because the ships often have to wait for the lock to be free, giving time to talk. However, if the lock is badly designed (for me) the Banana would block the approach for the ships and would be removed by the authorities. This is the case where I am now, so I have moved the Banana upstream and will have to hope a ship will leave the lock and stop outside to pick up the Banana and set off again; something they don’t like to do. The water has gone from the lock now so there must be a ship coming soon. So I must go, and leave this update until I come back if they don’t take me, or if they do…whenever and wherever I get off the ship. And yes, it is a cargo ship. So I am off! And, sadly I am back. Two German freight ships from the same company came along together. I spoke to the captain of the first one, he said he did not speak English so I used my almost useless German. His scotty dog joined in so no one could hear anything. I had a plastic trumpet around its head so it could make more noise. I got my message over clearly. “Boat Banana (bark bark bark) black sea going (bark bark bark bark) trip Europe (bark bark bark) hitch-hiking can going (bark bark bark bark bark bark bark bark ) you with Danube riding this day ship together?” (bark). They seemed to like the idea and nodded. I told them the Banana was on the left (right bank) and they nodded saying they were going to the Danube, and would stop once they got out of the lock. I thanked them and ran to the motorhome got my cameras, my bags and life vest and ran down to where the ship would stop, then ran back to the Banana, untied it and held it steady as the ships sailed out of the lock, with no sign of slowing down. The captain of the first one indicated the second ship as the one which would stop; it didn’t. Anyone who has been road hitch-hiking has had this done to them. The driver sees you slows down and stops 200m down the road, you pick up your back pack and run to the car which drives off just as you get there. I at least can come back to the motor home and have something to eat and a coffee. Moreover, it is a lovey day and who cares if I go nowhere? I can finish this off, go to the town center where there is an Italian ice cream café with internet (apparently) so I must suffer to get this message sent off. So I would like to send my thanks to the captains of the Tiamo and Securitas ships MSG company, wish them well on all their travels and hope that I meet them in a port along the way so I can show my full appreciation of their helpfulness. A small older man with a flat cap watched the proceedings. He looked embarrassed and commented that it was because of terrorism that the boats didn’t stop. 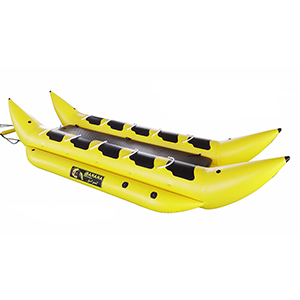 I wonder how many terrorists are planning to drag an exploding inflatable banana 600km upstream to attack a boat full of gravel? I have been on large ships where the families live all year around. This isn’t just hitch hiking; it is travelling with people in their homes, going along with their daily lives and meeting their children. I have quickly learned that on entering a ship, I should remove my shoes. Even the water police do this as a mark of respect that they are not only on board a ship but in a home. Whilst I was on the Aristo the captain received a text with a message for me from the captain of the Vagabond. Messages of my progress are going up and down the rivers, so next ship I get I will recount the events of today and the names of the ships and company involved. I would rather dwell on the greater majority of events that have been fun, happy and welcoming encounters that brainless imbecilic morons who through your possessions in the rivers or play un original, not funny pranks. It’s Tuesday 10th of May, forty days and forty nights since I set out with the Banana. I have approximately 1/8 of the journey done. The first part of this trip has to be the most complicated in terms of finding out how to get the lifts and also the lower Rhine and Maars Rivers with all their tributaries are very complex to get through hitch hiking. It’s like spaghetti junction on the M6, Birmingham; here, at this lock, although there have only been two ships going my way, if I am picked up I will be going in the right direction even if it is only one or two locks. I think I will go and get my ice cream now, the lock is full of water which possibly means no one is coming for a while. Je vous ai rencontré à l’écluse de Steinbach et nous avons parlé sur le tour du bateau banana. C’est très interessant et un peu drôle. J’ai lu un peu dans votre blog et j’ai constaté qu’il y a parfois des problèmes, mais aussi des situations très agréables et encourageantes. Je vous souhaite bon courage et bonne route.